« More from Christmas Bird Count: 1, 2, 3, . . .
For the last 5 years, I have lead a New Years Day Bird Walk at Greenwich Point Park. I feel it is a nice, non-commercial way to begin the year with a relaxing walk in lovely natural setting. Others agree, making it one of my most popular walks – this year 35 people joined our walk. Weather cooperated providing a nice morning, cool, partly sunny but none of the wind that can be so chilling by the water. Birds were not quite as cooperative. Although ducks and other water birds were scarce, we did see a total of 33 species of birds. (The complete list if shown at the bottom of this post.) It was good jumpstart to a 2014 bird list. 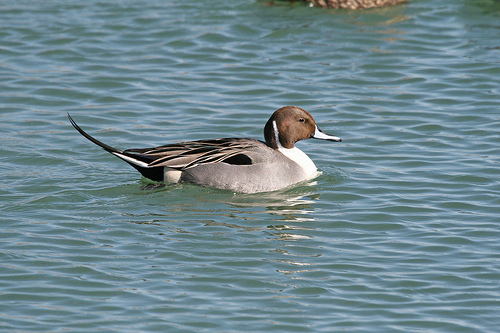 For me, the best bird of the day was a good close look at a N. Pintail. Its one of my favorite birds, quietly graceful and elegant. Most unusual sight was two joggers dressed up as bananas.